The front elevation of the Locke Tavern has 5 windows across on the second floor and 2 on either side of the front door on the first floor. This is the standard look of a 'Colonial' house. So why do I recognize immediately that this is an old house, not a modern reproduction? Before I began to measure and draw the geometry of these houses, I would have said, "It feels right". I could have cited the window sizes, the clapboard width, the casings and the corner boards, the space between the top of the windows and the eaves, etc... but I couldn't have discussed the shape. 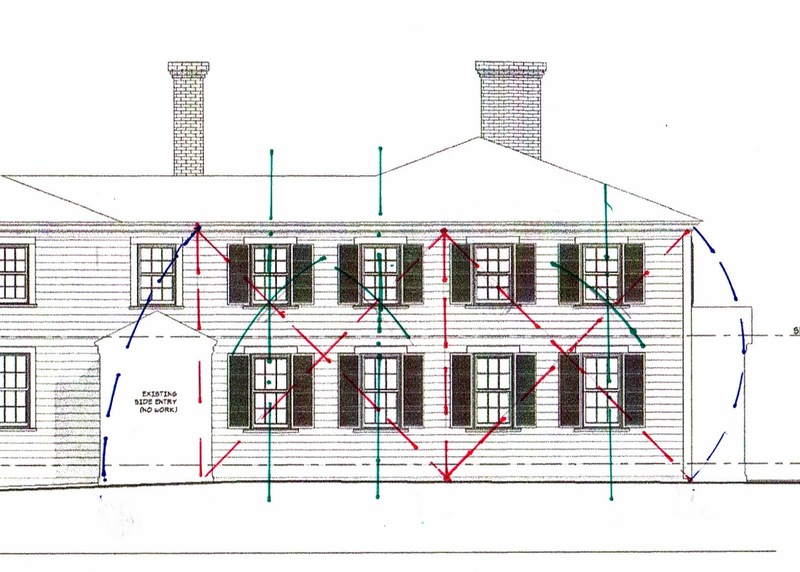 However, now I also see the proportions of the facade, how the windows were placed symmetrically around the center of each square side of the house and were set to reinforce that shape. I have added the lines that show this on the elevation. They are the Regulating Lines for this house. I have drawn the arcs only on one side - in green - for simplicity - it's getting crowded! To help explain this here is a square and its diagonal - in blue. 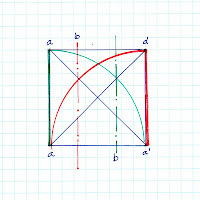 The radii of the arcs - in red and green - are the length of the side. 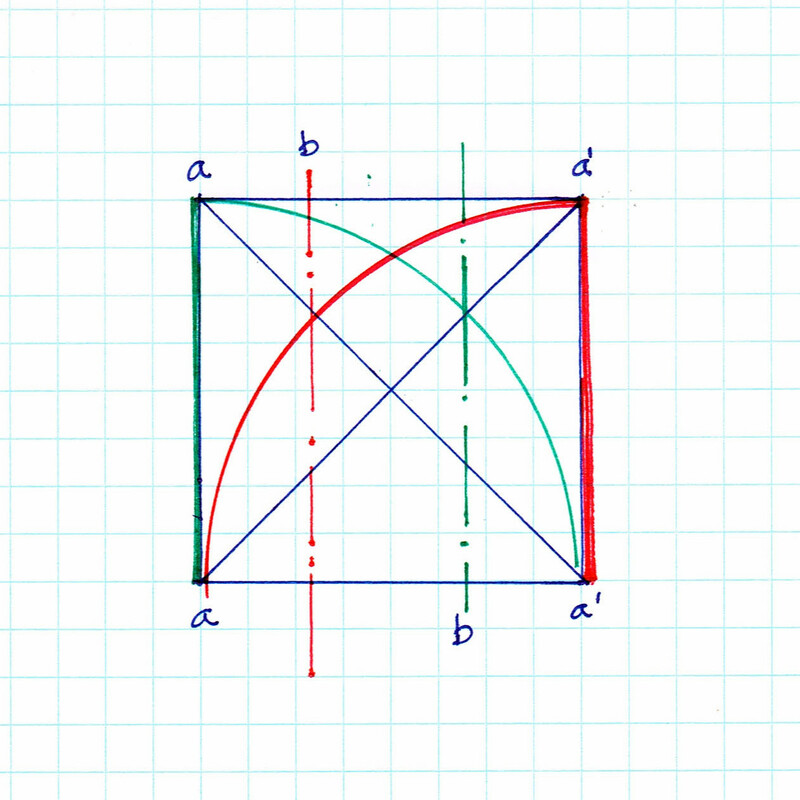 The point of intersection is where the arc crosses the diagonal - one side in red, the other in green. 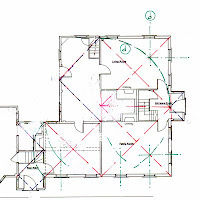 The resulting lines - red and green center lines - are the locations for the windows. The ratio between the side (a-a') and its length thus divided (a-b, b-a') is the Golden Section. It still "feels right." Now, however, I follow the rhythms. I see the pattern. I can even tell you about it, although maybe not without paper! The relationships on the side elevation are not pure. While the room to the left does follow the pattern. The window placement for right square doesn't 'compute'. The windows are, however, balanced across the length of the wall. 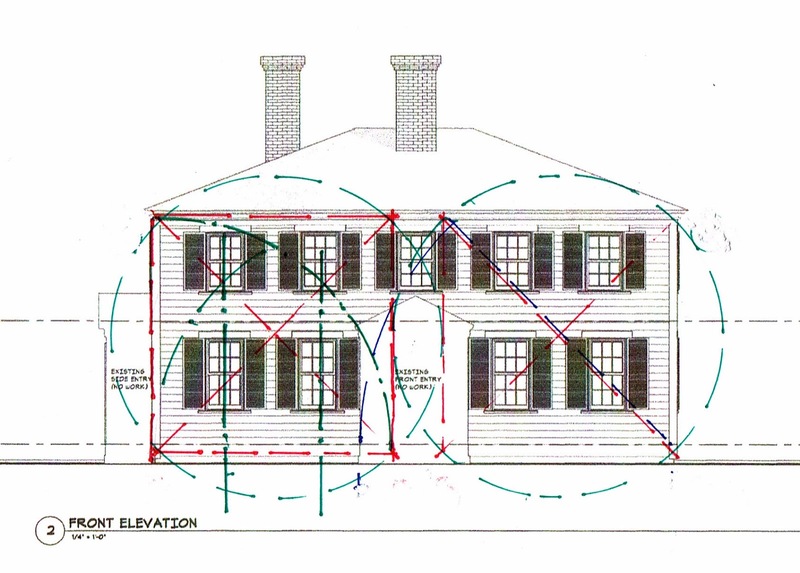 The placement of the windows on the front of the house - to the right - so clear in the proportions of the elevations, is not echoed the floor plan - none of the windows line up with the proportions of the plan. 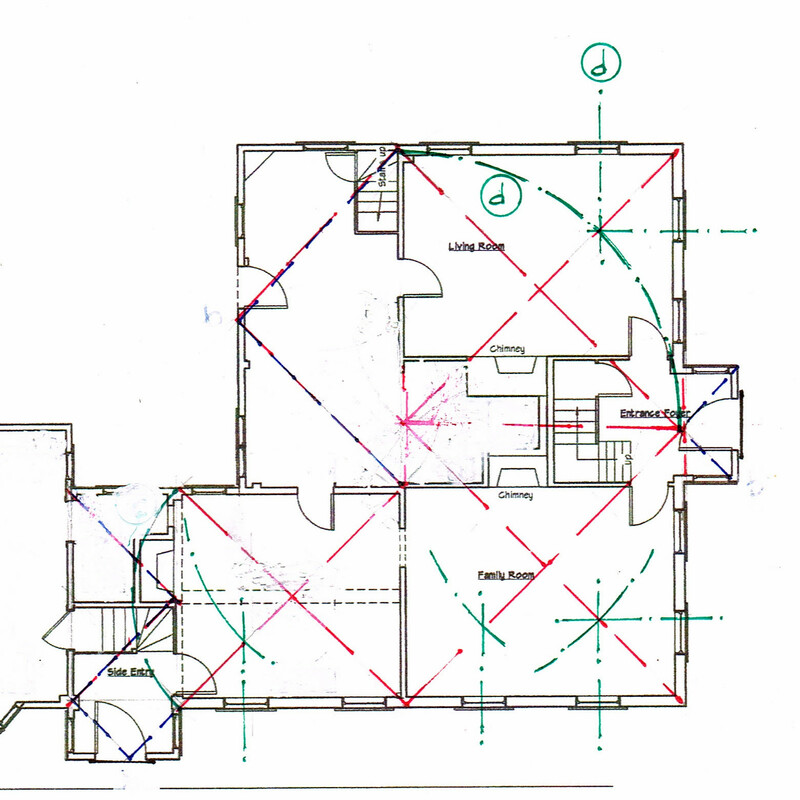 The west windows - lower right room - are clearly determined by the diagonals: the room has balance. But those in the back - left - room: one does, one doesn't. I wonder if perhaps the 2 squares which make up the plan were mainly used to determine the foundation, the center of the support for the fireplaces and chimneys, but not the framing or the window layout. 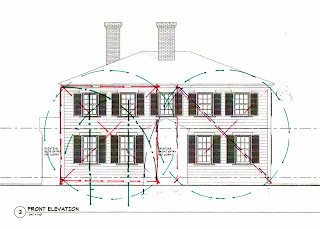 As a check, I laid out the geometry on the 1/4"=1'0" measured drawings for this house. The proportions remain just as clear. Please remember when you look at the drawings that exterior shutters were not in use in New England until after the 1820's. They are an addition - not part of the original design.